Official sites of hardware manufacturers are generic to the point of meaningless. They are good enough to look up exact specs, but aside from that you always have to look around to get full picture. 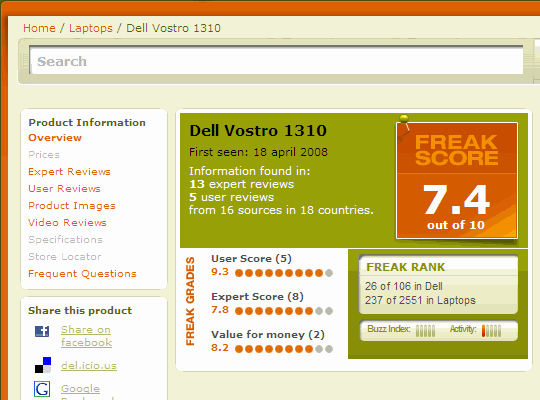 TestFreaks is portal that aggregates professional and user-submitted reviews for multitude of hardware. Site brings together different kinds of information (reviews, scores, media and more) to build comprehensive product pages. It also give own freak score that takes in account all of information. No exact formula is given but there are some explanations – it prefers expert reviews over user-submitted and newer information and products over older. I think for site of such type it is most important to get search right. And search at TestFreaks is excellent. It is incremental with near-instant feedback and large amount of categories covered ensure you find whatever you are looking for. Selection of content seems accurate (had only noticed some hiccups in summaries) and non-obscure products seems to have decent media galleries. Although images are often watermarked and I really wonder if they are used with permission. Great start point for research on any hardware.